With all the players jumping into the AI fray, some have forgotten one of the companies that started it all. Don't count out IBM just yet. Investors haven't been happy with IBM (NYSE:IBM) lately. Since Ginni Rometty started as CEO in January of 2012, IBM has seen 18 consecutive quarters of year-over-year declining revenue -- essentially every quarter of her tenure. The stock has lost nearly 10% compared to a gain of 78% for the S&P 500 over the last five years. IBM 5 Year Price Returns (Daily) data by YCharts. For IBM shareholders, Ginni Rometty's four-year reign as chief executive officer hasn't been anything to go to Disneyland about. But her company has become a leader in one corporate category: board members willing to shovel incentive pay at a CEO turning in a mediocre performance. 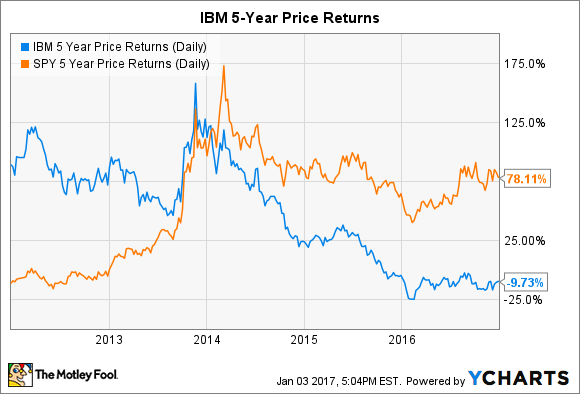 With all the negative sentiment and equally dismal stock performance, should investors have any hope that IBM will right the ship? IBM believes it can, and it's betting the future on Watson. You may recall how Ken Jennings, famous for his 74 consecutive wins on Jeopardy, was dethroned by Watson, the IBM supercomputer. Why would a company risk so much on a game-playing computer? The key is not in the computer as much as in the science behind it. IBM's Watson beats 74-time Jeopardy champion Ken Jennings. Image source: Flickr user edwardhblake. Watson is a system based on artificial intelligence (AI). Computer simulations of the human brain, called neural networks, mimic humans' capacity to learn. Using massive amounts of data and complex algorithms, an AI system gradually learns to recognize similarities and distinguish differences. It is taught to recognize patterns within massive amounts of data. IBM has been betting heavily on Watson by leveraging its AI platform and data analytics for a variety of business applications. The company's CEO has said that, in the next five years, every major decision -- personal or business -- will be made with the help of Watson. Several recent high-profile partnerships illustrate how IBM has been approaching this goal, and the strategy appears to be gaining steam. UA Record smartphone app powers Healthbox. Image source: Under Armour. Under Armour (NYSE:UA) (NYSE:UAA) announced a strategic partnership with IBM to leverage the 190 million registered users of its Connected Fitness platform and Watson's deep-learning technology. The system would provide users with individual health and fitness insights backed by data. It is intended to act as a personal health consultant, fitness trainer, and assistant. This collaboration underpins the HealthBox, Under Armour's connected fitness system, which combines a fitness band, digital scale, heart-rate monitor, and the UA Record smartphone app. It will track sleep, fitness, activity, nutrition, and training information, and provide personalized recommendations. This is a valuable project for IBM since Watson learns with each infusion of data. The partnership is a win for Under Armour as well, and is part of a bigger play. Its acquisition of three fitness app companies that now comprise its Connected Fitness platform, the release of Healthbox, and the integration of Watson provides Under Armour with an end-to-end health and fitness solution that connects to its users in a very real way. This will likely drive future adoption and boost customer satisfaction. OnStar Go powered by Watson. Image source: General Motors Company. General Motors Company (NYSE:GM) partnered with IBM to pair its OnStar vehicle-communication system with Watson's learning capabilities to create OnStar Go, a cognitive mobility platform. According to the press release, the new platform's numerous benefits include helping drivers avoid traffic, giving them the ability to order coffee on the go, making restaurant recommendations, and reminding users to pick up diapers and formula on the way home. Drivers will have to consent, and Watson will recognize their preferences and patterns in their decisions and habits. This will also develop individualized and location-based marketing. The partnership will present other business opportunities. OnStar has already signed iHeartRadio, which will provide personalized musical experiences, and MasterCard, which will allow consumers to pay for gas and other services from their car. Other partners include ExxonMobil, Glympse, and Parkopedia. iOS enterprise developers get access to Watson. Image source: IBM. Apple (NASDAQ:AAPL) and IBM's partnership was first announced over two years ago but has evolved in the meantime. Initially, the pair planned the development of over 100 enterprise apps for a variety of industries, including retail, healthcare, banking, transportation, and insurance. According to a recent announcement, enterprise iOS users will have in-app access to Watson, opening the door to deep-learning technology for these made-for-business apps. iOS app developers will be able to use Watson's AI as a platform for their own apps. Apple has already benefited from the partnership by gaining inroads into enterprise. IBM announced last year that it had begun to replace its PCs with Apple Mac computers. Employees were given the option to make the switch and 73% chose Mac. In a presentation at Jamf Nation User Conference, a gathering of Mac system administrators, IBM told attendees that PCs were three times more expensive to manage, Macs had a lower total cost of ownership, and that the Mac was the standard at IBM Japan -- PCs were the exception. These recent developments will provide greater validation to Apple's prospective enterprise customers while advancing the company's AI agenda. Apple has an installed base of over 1 billion active iOS devices with a growing percentage of those in enterprise. This, combined with Watson's ability to learn from streams of data, will provide both companies with a stronger relative position from which to compete. These collaborations are merely the most high-profile examples of hundreds going on behind the scenes. IBM tweeted earlier this year that more than 500 partners and 80,000 developers were building products and apps powered by Watson. The installed base that comes with the partnerships is growing, and should eventually show up in IBM's revenue and provide vindication for the company's Watson-centric strategy. IBM expects Watson to contribute $1 billion in revenue by 2018, and $10 billion by 2023, though it doesn't currently break out that contribution. Strategic Initiatives, where Watson's revenue resides was $8 billion in the most recent quarter, of $19 billion total revenue for IBM. It's a relatively small slice for IBM now, but it's clear the company expects to build AI into a major pillar of its business in the next few years. If it works, it might just reverse fortunes for the flailing big tech company.